Standing in Winnipeg Square in the City of Winnipeg in Manitoba, Canada, people can admire the unique architecture reaching a height of 420 feet of the Canwest Place building. Spanning the skyline in the City of Winnipeg in Manitoba, Canada, the Canwest Place building has 32 floors to reach a height of 420 feet, making this the tallest high rise in the city. 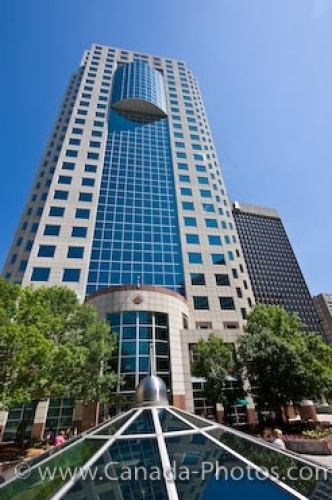 Construction was completed in 1990 at Main Street and Portage Avenue and designed by the Charles Bentall Architects. As the sun glistens off the blue windows of Canwest Place, the interior of the building is home to many luxurious offices, a 9-storey parkade, a fitness centre and a food court. An underground area is connected to a skywalk making access easy to other office buildings, hotels, dining establishments, banks, shopping and entertainment venues. Picture of the Canwest Place building in the City of Winnipeg, Manitoba in Canada. ... The grounds below the building are known as Winnipeg Square and have become the ideal place for people to relax throughout the day.